A PAC is a ministry (organic church, multi-site, multi-congregational, new work, NewStart, etc.) that is reported as affiliated with a parent church. A PAC has a leader or pastor who is responsible for pastoral care of the group, and is connected with a parent church. We want to recognize and celebrate what we want to reproduce! The PAC designation was created to address the needs of churches beginning creative new congregations, who had no way of reporting those new works. 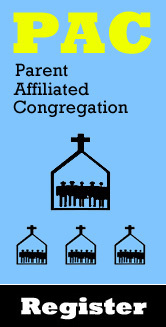 Ethnic congregations, organic churches and multi-sites are notable examples. If these affiliated congregations are not registered, they do not receive literature, are not identified via official channels, and do not appear in any database and thus are "off the grid" and unidentifiable for collaborative efforts, networking, and mutual encouragement. WHAT'S THE DIFFERENCE BETWEEN A PAC AND A CHURCH TYPE MISSION (CTM)? CTMs are any not-yet-organized churches which may or may not have a parent church. In contrast, PACs are affiliated with a parent church and may be classified as a not-yet-organized church or an organized church. IF A PAC IS NOT A SEPARATE ENTITY, WHAT'S THE DIFFERENCE BETWEEN A PAC AND A SMALL GROUP? A small group which is started to reach new people could become a PAC. PACs normally have a leader, are evangelistic, and function as distinct congregation. Final definitions are left to the discretion of the parent church and PAC leader. HOW ARE PAC STATISTICS REPORTED? All PACs are assigned a unique church number. A PAC will appear in the District Journals and within computerized data systems at the Global Ministry Center indented beneath the parent church. This solves a reporting (and identification) problem for congregations-within-churches. A PAC has the option of including some or all of its statistical data with the Parent Church's data. Both the Parent Church and PAC will fill out the Annual Pastor's Report, but there is great flexibility in how the statistics are divvied up, since in all reports they will appear together. WHAT ABOUT "FUNDING THE MISSION?" PACs are not a new method of increasing giving. Congregations registered as PACs contribute to “Funding the Mission” based on reported income, just like all other CTMs. Whether the parent congregation reports the income or the PAC reports the income is entirely between the parent church and the PAC. Whichever one reports the income would contribute to "Funding the Mission." WHEN WILL THIS BE IMPLEMENTED? The PAC designation was approved by the Board of General Superintendents in May, 2011 and is available for immediate use when registering a new congregation.